Maurice Ashley is about the Business! The HB Chess Challenge will be the largest open tournament in world history. With a $500,000 prize fund for the taking, Grandmaster Maurice Ashley will attempt to inject much-needed excitement into a troubled American chess landscape. With the pending move of the national headquarters to a place few have heard of, people like Ashley and Hikaru Nakamura become saviors in a dying sport. Ashley recently appeared in Black Enterprise, a magazine targeting the Black middle class. Despite referring to a Grandmaster with the infantile "chess whiz" label, the article's presentation is rather classic (see right). The article contains material found in the other hundred Ashley interviews, but in this one, Ashley gives a brief history of chess and also provides a reading list. Recommended are: Logical Chess: Move by Move by Irving Chernev, Bobby Fischer Teaches Chess by Bobby Fischer and My System by Aron Nimzovich. One interesting point in the article is the notion that traditional chess clubs are dying due to the onslaught over Internet chess. The HB Global Chess Challenge has already brought many out of retirement. Let's hope for the best! 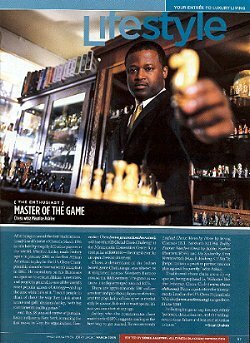 GM Maurice Ashley in the March 2005 issue of Black Enterprise magazine.